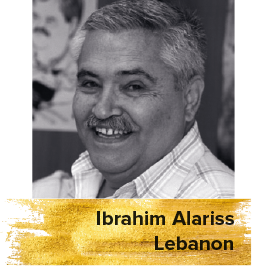 Born in Beirut in 1946, Ibrahim Al-Ariss is a renowned Lebanese film critic, cultural history researcher, translator and journalist. He studied Film Direction in Rome, Screenwriting and Film Criticism in London. He has been working in the field of journalism since 1970. Al-Aris is currently Head of the Cinema Division at Al-Hayah magazine. He has translated over 40 books from different languages- French, English and Italian. Among his most notable books are A Journey in Arab Cinema and Martin Scorsese: A Cinematic Biography.